Yesterday the annual Norman Trzaskoma Invitational took place at Ivey Redmon where all the Forsyth County schools faced off in a 2 Mile. On the boys side graduation just took a heavy hit on the county with All-Americans John Tatter, Cameron Ponder and Michael Moerk heading off to college. It was time for a new boy to take the crown amongst a strong junior class. On the girls side the top it was a mix of young stars in battling out with Reagan senior Ainsley Cooper for the title. The boys race went off first a lot of boys hanging on up front. Early on no boys really established themselves up front as a lot of the top runners were patient to make their move. As they came through the mile three juniors in Jacob Gallant, making his debut for Mount Tabor, Ben Armentrout (Atkins) and Jack Holbrook (R.J. Reynolds) lead the charge with four others trying to hold onto the early pace. As they ran the last mile Gallant and Armentrout ran side by side most of the way as Holbrook fell slightly off their pace. Gallant was able to pick up speed coming down the homestretch to pull away from Gallant to come home with the win in 10:04.53 with Armentrout a second and a half back at 10:06.15. Holbrook took 3rd in 10:09.50 as R.J. Reynolds teammate John Paynter was able to take 4th in 10:10.16 ahead of James Vlasis (Mt. Tabor) and Will Atkins (West Forsyth). Gallant and Armentrout's times rank #4 and #5 All-Time in meet history only behind Cameron Ponder and John Tatter who ran 9:43 and 9:48 last year and Ian Milder who ran 9:59 in 2013. The meet was previously run at West Forsyth until 2015 moving to Ivey Redmon, but it certainly shows these boys are in for a big season. The team scores were a surprise with West Forsyth boys taking the team title over Mount Tabor, Reagan and R.J. Reynolds. West Forsyth boys returned as the #4 team in the county behind the three mentioned above, but were able to score 5 runners before any other team scored 4. They were lead by Will Atkins taking 6th place and senior Brock Newsome taking 10th overall. They had a big day from three sophomores in Jeremy Eldredge, Jackson Nichols and Cole Meixsell placing 13th, 14th and 15th respectively securing the team title for the Titans. It was going to be a battle between Reagan and West Forsyth girls who came into the meet virtually equal in the returning rankings. 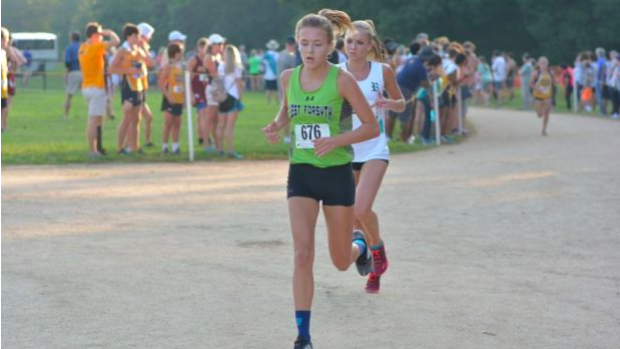 The team also had two of the three girls who were main contenders for the individual title in Ainsley Cooper (Reagan), Eliza Broce (West Forsyth). They would battle with Mount Tabor's Frances Whitworth who was the county's top returner with a 18:22 5K PR. Cooper took out the pace hard from the gun, and only Broce would go with her through the initial loop at Ivey Redmon. They came through the mile and things were the same up front, but Broce had taking over the pace from Cooper who sat just behind her. Whitworth had a conservative start, but made up a lot of ground through the mile sitting alone back in 3rd. Broce was able to pull ahead of Cooper and held on through the line clocking an impressive 11:44.51 to kick off her sophomore season. Cooper held off Whitworth for 2nd clocking 11:53 to 12:00. Kendall Phillips (West Forsyth) had a very strong last mile reeling in Gwen Parks (Reagan) to take 4th in 12:20. This run for Broce was a very strong start to her season. She'll take home a new Norman Trzaskoma Meet Record from Reagan's Isabel Zimmermann which previously was 11:48. Zimmerman went onto run 18:03 that year. West Forsyth girls dominated placing 8 girls in the top 8 with Bailey Reutinger, Shelby Lowder and Zavera Basrai placing 6th, 7th and 9th respectively. They took home the team title over Reagan with a score of 26 to 47. This is a very impressive start for West Forsyth as the Titans look to improve on last years 3rd Place finish at the 4A State Championships.